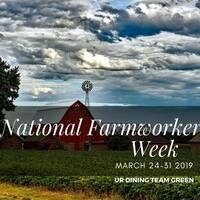 This is the capstone event for Dining Team Green's National Farmworkers' Awareness Week, taking place from Monday, March 25-Friday, March 29. We will be joined by farmworker women from groups such as Mujeres Divinas and Alianza Agricola, along with their allies and colleagues from the Workers Justice Center of New York and the Rural Migrant Ministry, in conversation about the lives and experiences of women working in agriculture. This powerful group of women will share some of their work in community building and advocating on behalf of the farmworker movement, and together will consider questions of "where do we go from here..."
This week is co-sponsored by the Paul J. Burgett Intercultural Center and supported by a One Community Grant.